Hi! 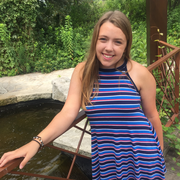 My name is McKenzie Jordan and I am a junior at Lake Forest College studying elementary education and Spanish. Last summer, I was a camp counselor for a girls sports camp for 3rd to 6th graders. I am looking for a nannying job for this winter/spring semester and/or summer. Please let me know if you're interested. Thank you! !